Having two healthy feet is something most runners take for granted. Until one gets injured. Foot care is often overlooked by runners who stretch hamstrings, quads and calves but miss their most important part. Feet take the first impact of every step. They also help us stay upright, balance and learn about our environments. Here are some of Team ECRP‘s favorite ways to keep them healthy and happy. Find the right shoes. If your shoes are too loose they can rub and causing blisters. Too narrow and you’re susceptible to callouses, too. If they’re too small, add in the risk of black or falling off toenails. 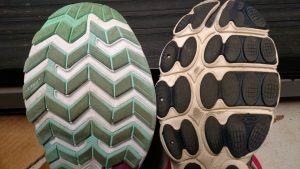 When you buy running shoes, do so from a reputable running store and make sure the fit is correct. And, once you have the correct shoes, know when it’s time for new ones. Socks. There are tons of socks out there, and you want to be sure you’re running in the right ones. Cotton socks can lead to blisters while other materials, such as acrylic, can help protect your feet from rubbing by pulling sweat and moisture away. You might need to vary your sock choice based on the weather, a light sock won’t be equally fit for a speed workout and racing a marathon. Although there are lots of choices, socks are fairly inexpensive, so try different brands, fabrics and cuts until you find what works best. Keep your feet dry. This can be hard if you’re running in the rain, on the trails, in snow or on the beach. Waterproof trail shoes are a great choice for those who brave nature, but for those who run mostly on pavement or a treadmill, the answer is usually to wear moisture wicking fabrics. Never start with damp or wet socks and shoes and keep an extra pair nearby for when you’re finished. Massage your feet by rolling them on golf or lacrosse balls, a rolling pin or foot roller. Not only will a foot massage relax those hard working muscles, it’ll give you a few minutes to chill out and take a break. Be careful, though. Rolling or massaging your feet too hard can cause damage to tender fascia and harm, rather than help, this important body part. Make them strong. Do foot and ankle strengthening exercises. Weak feet mean you lose out on power and speed while increasing your risk of injury. Try being barefoot as much as you can. Shoes support muscles so they don’t have to work. Taking off your shoes will strengthen the arch of your foot while aiding in your body’s ability to sense what’s happening around it. Use these tips to keep your feet in good working condition and they’ll help you hit a new PR. 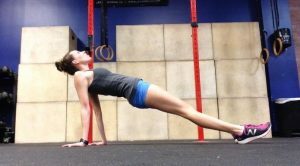 This entry was posted in Injury, Running, Strength Training and tagged foot care, injuries, injury prevention, marathon, racing, running, strength, strength training on June 19, 2017 by Coach Meredith.